​2018 will go down in the history books as a banner year for community solar in New York State. More solar capacity than ever has come online in the past three years, and that pace of expansion ​has resulted in a banner year here at Renovus Solar. For Renovus, this is a special time. Our passion has always been born of a desire to make solar accessible and impactful. In 2003 we opened shop with a staff of three, with big dreams of making solar easy to understand and affordable to access. We ​were thinking big, but even we would not have imagined the sea change currently taking place in New York State. For our customers, this means a few things; More options, bigger savings and faster deployment. Interest in ownership of our community solar farm​s has hit a fever pitch, and if we're honest, for parts of 2018 we had a hard time keeping up with that demand. This record-breaking year has Renovus building or interconnecting five new solar farms, with a total capacity of more than 2.4MW. Since 2015, when Renovus built the first-ever ownership model solar farm in NYS, we'll have completed a total of 12 solar farms. We couldn't be more proud. This has been a year of firsts, let's check out some of the highlights! Early in 2018, Renovus sunk the first pile on its largest single ownership model solar farm ever, Solar Farm 8 in Catlin, NY. This 1.25 MW solar farm sits in the Southern Tier of NYS and is servicing 130 homes and businesses, including a developer who is using solar power generated by the farm to power apartments in downtown Ithaca. Solar farming takes land, and the use of either current or former agricultural land has been a hot-button issue for communities ever since Renovus introduced community solar to the market. While we maintain that land-owners should always have the right to do whatever they feel is best with their land (within legal bounds of course), Renovus felt compelled to find another solution. In 2018 we launched our first-ever rooftop solar farm in Candor, NY. Another in Spencer, NY quickly followed in its footsteps. Both farms have an aggregate capacity of nearly 280kW and will be powering the homes of more than 20 NYSEG customers. This approach minimizes land-use and maximizes the value of existing buildings for property owners in a way never-before-seen in NYSEG territory. Expanding solar farming upward on to roofs was a big step, but expanding service to more than 700,000 National Grid clients in Central NY was an even bigger deal for our team. ​Community Solar Ownership had never existed in CNY until Renovus opened up our 220kW farm in Homer, NY. This farm sold out in record time and will be powering more than 20 homes in CNY with clean, affordable solar power. Renovus is planning further expansion into Central NY in 2018 with at least two more solar farms and is currently taking reservations for its next project in Virgil NY. As we mentioned earlier, responsible land use is essential. In our quest to make something great out of less-than-ideal scenarios we arrived at our most recent solar farm, Solar farm 12 in Candor, NY. This 350kW system will power more than 30 homes, and sits on top of a brownfield. Due to years of dumping of whey protein on the site from nearby food manufacturers, the site was no longer viable for agricultural purposes. Renovus ​has stepped in with the help of the first ever NYSERDA Brownfield designation, and will be able to transform this acidic soil to a clean power source for dozens of homes. ​Across the state, Renovus is pushing frontiers with the goal of bringing solar to every home and business in the state. As always, the focus will be on our customers and what this explosive growth means for them. The results for most of our clients are simple; Solar will save you boatloads of money. Since 2019 is the final year of the full 30% Federal Tax Credit, we expect solar demand to be at an all-time high. To meet this demand, we're planning on a minimum of five solar farms, bringing our grand total to as many as 17 solar farms in the past four years. We'll be adding a minimum of 2MW of solar in NYSEG territory, 750kW in National Grid territory, and as much as 1MW in Rochester Gas & Electric territory. That's enough to power more than 500 homes, and save customers more than $750,000 in utility bills. If you're interested in joining Renovus as we change the energy landscape in NYS, reach out to our team. We'd be thrilled to show you how much you can save by leveraging the power of community solar. 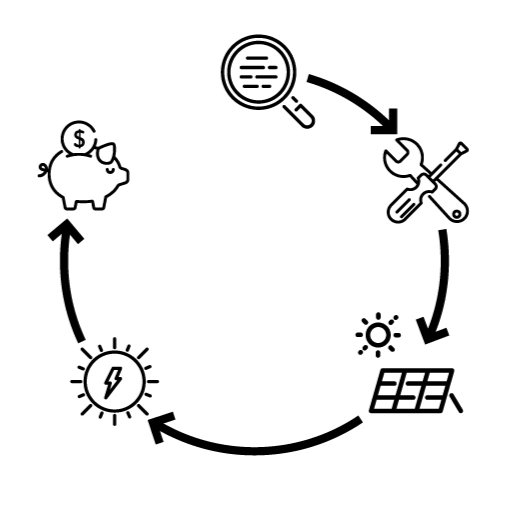 ​Our Solar Buyers Guide will help you understand the process of going solar, from A to Z. ​Download Your Copy For Free! ​Thanks for your interest in our community solar farm! Enter your information below and our team will reach out to size a system based on your energy needs.